Lately there’s been a lot of talk about what’s happening with the automotive industry. Are we on the brink of a downturn? Are we breaking records? It seems like each month there are new reports from analysts warning about an impending downturn, but with this March seeing some of the best sales numbers since 2000, it’s hard to know exactly where the market stands. That’s why the Traffic Institute has done a market analysis, digging deep on some of the biggest warning signs dealers should be watching as they plan for 2017 and beyond. For the purposes of this report, we focused on some key metrics that signal where the market is heading, specifically manufacturer incentives, inventory rates, financing availability and consumer loan terms. Industry experts have been forecasting a market downturn since early 2016. And after several years of continuous expansion and record-breaking year-over-year increases in sales, the question of when the market will turn is no longer one of if, but when. 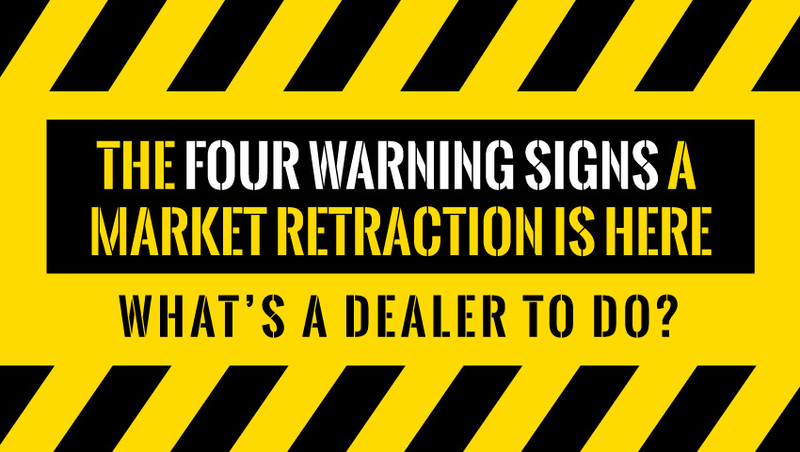 It’s inevitable that what comes up, must come down, so now the key for independent and franchise automotive dealers will be to tune in to warning signs that the market may be retracting. Right now, the market is showing several significant warning signs of oncoming retraction. Many dealers have a hopeful outlook after experiencing a bump in sales this March. Because January and February are typically slower months for the industry, the increase in March might suggest to some that this is the normal ebb and flow of what is typically regarded as a seasonal industry. But that may not be the case. “If you only look at the sales numbers, it could be tempting to say that the industry is just as strong as it was a year ago,” said Jessica Caldwell, executive director of industry analysis at Edmunds. But manufacturers are relying on more and more generous incentives to keep traffic up, which signals diminishing consumer demand. In fact, despite a strong March, Q1 2017 was flat year-over-year, with an 8% decrease in new car sales. But increasing manufacturer incentives isn’t the only warning sign that the market is softening. “There are several areas of concern this year lurking just below the surface. Inventories have reached levels not seen in more than a decade,[…]incentives are rising. We’re also seeing an increase in loan terms and indications of a rise in subprime lending, which demonstrate sales aren’t coming as easily as they used to.” Caldwell said. Despite a relatively strong end to 2016, the slow beginning to 2017 saw manufacturer inventories soar, ballooning GM’s days-supply by 52% and Ford’s by 41%. For this reason we’re starting to see major cutbacks on production for both these manufacturers. Ford started rolling back production in December 2016 even paring down production on popular models like the F-150. And at the end of March, CFO Bob Shanks warned that production cuts and idling plants were likely to continue in 2017. This approach is eerily familiar to what the manufacturer was doing in 2008 when Ford experienced waning demand. And in March, just weeks after laying off the entire third shift at a factory in Lordstown, OH, GM shutdown the same plant for three consecutive weeks to align production with market demand. However, production cuts are unlikely to fully resolve inventory issues. And when suppliers are overstocked with aging inventory, it has a trickle down effect for dealers. Despite cutbacks on production, manufacturers typically pass this aging inventory on to franchises, leaving them with a large inventory of cars that have little market demand. 3. Have You Lost A Lender Lately? As market demand dwindles and inventories rise, dealers can also expect it to get harder to get deal’s done. Many dealers have likely noticed a tightening of banks lending practices. This has a big effect on the ability to help customers with lower credit scores. The Senior Loan Officer Opinion Survey On Bank Lending Practices (SLOOS) released at the end of each quarter by the Federal Reserve Bank confirms these concerns. In fact, the January SLOOS Report noted that “banks responded that they expect to tighten standards on auto loans and to see asset quality of both auto and credit card loans deteriorate somewhat over 2017.” Moreover, some banks reported seeing a decrease in the demand for auto loans, further signaling the erosion of demand for new and used vehicles. While there are still some customers who would like to upgrade their vehicle, many of these people are unable to get financing. And if overall demand for vehicles is declining and the people who are in-market can’t get approved, the market is going to shrink dramatically. In order to get potential customers approved, many dealerships are resorting to longer loan and lease terms to keep payments down. In fact, consumers are financing more of the cost of vehicles and for longer terms, reaching 84 months in some cases. Simultaneously, average interest rates are expected to climb on auto loans this year. The problem here, of course, is that many of these customers will be underwater in their vehicle before they’ve repaid even a fraction of their loan. That means that when consumers are typically ready to consider a vehicle upgrade, 1-3 years after their vehicle purchase, it will be nearly impossible to refinance their vehicles because there will be too much negative equity—thus further shrinking the market. The bottom line is that the market is at the beginning of a downturn, and we’re seeing the same warning signs now that we saw in 2007-2008. That means the market is changing and it’s going to change fast. So what’s a dealer to do? The single most important thing for dealers to do right now in order to prepare for the inevitable market downturn is to develop a system that allows you to control the market as opposed to the market controlling you. When the market retracts, there are simply fewer buyers out there than there were previously. Maybe you’ve already started to see this via dips in showroom traffic and lead counts. When this happens, the dealers in any given area are fighting with one another for “their fair share” of the market. All this talk about market share and market penetration causes dealers to view the car buyer universe as a limited pool. It’s believed that there are a finite number of sales that will happen in the market in any given period of time. So in order for one dealer to sell more, necessarily, another dealer must sell less. It’s a big tug-of-war between all the dealers in the market. Naturally, of course, cutting prices seems like a smart way to compete. Especially when everyone else is doing it. However, our experience working with over 500 dealers has proven that the car buyer universe is not nearly as limited as most believe. It would be a stretch to call it infinite, but let’s call it vast. If you analyze the overall market, you’ll find that roughly two percent of the people in any geographic area are currently shopping for a car, be it new or used. That means that a whopping 98 percent of people in the area are not shopping at all. In the meantime, most dealers are fighting over that two percent of in-market buyers (we call these people Active Shoppers). And nearly everyone is completely ignoring the 98 percent (we call these people Sleeping Buyers). Seems to make sense, doesn’t it? Why bother paying attention to people who aren’t shopping? Some people yap about creating brand awareness or top of mind presence. That’s a cute idea, but it doesn’t actually work, and dealers aren’t willing to spend money on that. So the 98 percent, the Sleeping Buyers, go ignored. All the while, the Active Shoppers stay up late at night stalking dealers’ web sites, doing research, trying to determine how best to steal the car from the “greedy” car dealer. They find web sites that purport to expose the “true” price a dealer paid for the car. Of course, that’s about what they’re willing to pay. Let the games begin! This person becomes a lead by entering their information into multiple dealers’ web sites and multiple third party vehicle listing services, and next thing you know, the tug-of-war is raging! Dealers are fighting for this customer and the handful of others that have entered the market that day. At the end of the month, the in-market Active Shoppers have been scattered all around the map, with each dealer selling a little more or a little less than the average. Everyone is exhausted; there’s blood on the floor. You’ve won some. You’ve lost some. But you never seem to make any major strides. That’s because you’re fighting over scraps, when you could be hoarding the tenderloin and the chops all for yourself. The biggest opportunity in the car business, and the secret to preparing for the market to erode, is learning to market to and attract the Sleeping Buyers, the 98 percent. These are people who haven’t done much research and don’t know (or care) what you paid for the car. These are people who are excited to get a new car, and are willing and eager buyers, as long as you can help them get what they want. LOWER PRICES + LOWER PROFITS = MORE CARS SOLD is not a formula for success. This myth is based on the flawed logic that if you sell for less you’ll naturally make up the difference in volume because of all the new customers you’ll attract by having the lowest price on the vehicle each and every person is looking for. But it’s nearly impossible to always have the lowest price and there is no second lowest price, only a lost sale. Here’s what you need to understand. In the car business, there’s a way to turn the 98 percent, the Sleeping Buyers into customers. The reason is that people care about their vehicles. They care about the car they drive. The love of the automobile is engrained in the fabric of what it means to be an American. Cars are a part of American culture, a part of our identities. Our neighbors see us driving our car; our co-workers see us pull up in our car; our friends and family ride in our car, and the car that sits in our driveway represents our family. The car is a status symbol. Our car represents who we are and how we feel about ourselves. These things are important. And because they are so important it creates a unique phenomenon we call The Miracle Of The Car Business. And if you tap into it, you can create a virtually endless pool of customers who only want to buy from you. Here’s a bit of harsh reality: none of this matters one bit unless people actually peel their butts off their couches and come to the dealership to BUY A CAR…RIGHT NOW! There’s too much confusion these days about name recognition, brand awareness, top of mind recognition, search position, reviews, frequency, etc. It’s ALL important, but the only thing that counts is when someone shows up. Agreed? SO you need to give them a reason to take action today. Not next week, not tomorrow, but TODAY! One of the biggest problems facing dealers today is that all dealers, all dealerships, look the same. We aren’t talking about their physical look, although that too, but we’re really talking about the public perception. The public is bombarded with automotive marketing messages that all look and sound the same. The sooner you realize the severity of this problem, the sooner you’ll begin to reap the rewards of finding a solution to it. Here’s the reality: Same Is Lame. If you look up “lame” in the dictionary, it’s eye opening. It means, “pathetically lacking in force and effectiveness.” Think about that. If your advertising looks the same, and it’s lame, then it’s lacking force and effectiveness. If your marketing is lacking force and effectiveness, then it can’t possibly deliver the kind of results you’re looking for. It’s basically impotent; it’s a frustrating waste of time and money. If you’ve ever wondered why your advertising isn’t pulling, this may a big part of it. It’s also the reason you’re constantly searching for new and different marketing gimmicks. Deep down you know that your marketing needs to be unique and different in order to help you stand out and attract customers. You just don’t know how to do it. And we suspect you’ve also discovered that neither do any of the so-called advertising and marketing companies out there. They have no freakin’ clue either. It’s a classic case of the blind leading the blind, often ending with the “creative” people coming to you and asking, “What do you want to run this month?” Pathetic! So now you know Same Is Lame and that it is a complete waste of time, energy and cash to market and advertise the same way as every other dealer. That begs the question…how do you break the mold? How do you break away and look and sound completely different, be something totally unique? In order to begin this process, you must answer two questions that are on the minds of all your prospects, whether they are Active Shoppers or Sleeping Buyers. And by the way, the great news here is that most dealerships are not addressing these questions in their marketing (or whatsoever), so when you enter the conversation and answer these questions, you can stand out and attract customers. It’s almost an impossible question to answer for most dealerships. Usually dealers want to race to say, “Well, we’ve got a great selection. We’ve got excellent service. We have a wonderful location. We’ve been in business 75 years. We’ve got the lowest prices.” The problem is that ALL dealers say that stuff. Have you ever seen a dealership offer poor selection, bad service, awful location and high prices? The reality is most customers don’t care when you talk about that in your advertising. They EXPECT good service. They EXPECT quality vehicles. They EXPECT a good selection. Then they’re let down when their expectations aren’t met. Dealers do a pretty pathetic job of differentiating one dealership from another, and the manufacturers add to the problem, because they want all dealerships to look the same. Think about advertising co-op or the building allowances they give you. What’s it all designed to do? It’s designed to homogenize—to cause you to look like every other dealership of the same make and for you to promote the big brand, not yourself. Culturally, the car business has failed to differentiate itself dealership by dealership, so there remains no reason to choose one over the other, except price. So then, price becomes the chief motivator, the chief driving force, the only reason to choose. Plus, quite frankly, people are generally ignorant about most industries and product categories and if they aren’t ignorant they are not confident about what they do know, so they default to the easiest and most natural reason to choose and compare…price. But it is possible to differentiate yourself and cause people to choose you for reasons other than price (such as solutions, expertise, notoriety, special offers, security, celebrity, trust) and end up making a higher profit on every transaction. That’s right, you will end up with more customers and a much higher profit than if you follow the traditional Same Is Lame automotive marketing model. This is what we were talking about when we said you need to create action—NOW! The truth of the matter is that you need to sell cars now (and later), not just later, which means you have to give people a reason to get up off their butts and come to the dealership to buy a car. The secret is to leverage the “Something For Nothing” Aspiration. You see, everybody would like to get something for nothing. That’s why people play the lottery, participate in extreme couponing, hunt for BOGOs and play on game shows. And it is possible, even advisable, to leverage the “Something For Nothing” aspiration in your effort to attract customers and cause people to choose you right now. There’s nothing dirty about it. It’s the driving force behind all sales. But it’s important that you understand the science behind it so you can maximize the effects of the application. What it boils down to is this: all special offers tickle customers’ greed glands. If you want to capitalize on the “Something For Nothing” psychological trigger, you need to properly make special offers. The key to tapping into peoples’ “Something For Nothing” Aspiration is incorporating three elements into your marketing. Those three elements are scarcity, urgency and believability. And when you use these three elements correctly, you’ll get dramatic, rapid response. Scarcity is when there’s a limit to the number of people who can take advantage of the offer you’re making. Urgency is when there is a limited amount of time to take advantage of the offer. Believability is when the customer believes it’s true. Important to note, just because it is true doesn’t mean they’ll believe it. There’s a huge difference between believability and truth. They work best when combined, but don’t confuse them and try to substitute one for the other. Your offers should be true and believable. Experience shows that when you create a deadline (urgency), when you give people a time frame in which they have to respond, response dramatically increases! Most car dealers don’t understand this fact and miss putting deadlines and reasons to act now into their marketing. People are terrified of missing the opportunity. Fear of loss is always a stronger motivator than the potential for gain. “Cash For Clunkers” is a perfect example. “Cash For Clunkers” worked because it had urgency—there was an end date. Same concept is at work with scarcity. People are worried you’ll run out before they get there, so they rush to get their fair share. “Cash For Clunkers” had scarcity because there were limited funds. But it’s all worthless without believability. “Cash For Clunkers” had believability because it was backed by the federal government. However, there’s a much easier way to create believability, a way you can control: presenting a reason why. Simply put, a reason why is exactly what it sounds like. It’s a reason why you’re making an offer. There’s a tremendous opportunity for car dealers to forget about nonsense offers that have no basis in reality, and start finding real reasons to make real special offers. A truthful and believable offer with a truthful and believable reason why is one of the most powerful marketing elements in existence. If you decide to do this on your own, you have to get creative and come up with new ways to explain WHY you’re having a sale or making a special offer and you have to do it every single month in a fresh, fun and relevant way. For instance, if you’re offering to pay more than a trade is worth (like the “Cash For Clunkers” offer) you must explain why you would do such a thing. Is it because there aren’t enough used cars to go around or because used car prices are rising at the auction? If you’re going to cut the price on a specific vehicle, why? Is it because you received more than you ordered? Or is there a space constraint? Given a reasonable explanation why you would offer “something for nothing” most people would be more than happy to rush to receive your offer. Finally, And Potentially Most Importantly, If You Want To Take Back Control Of Your Market, You Need To Quit The Car Business. That’s right, if you really want to stand out and sell more, you need to stop selling cars and start selling solutions. Stop selling cars and start selling solutions. Solutions are what people seek every day. Our lives are hectic. We have no time. We are stressed. We are frustrated. We’ve got problems. Can you identify with all of that? What people are looking for are solutions to those problems, to those stresses and frustrations, to the things that are wasting their time. They’re looking for a solution to make them feel better, to make their pain go away, and sometimes a purchase of something that they’re emotionally tied to, something that they see as a representation of themselves, does a lot toward solving a problem or making a desire come true. When you start selling that, when your marketing is about that, not prices and vehicles, then you can tap into that 98 percent, the Sleeping Buyers, and start talking to them, which drives a ton more traffic! This is the whole key. The key to surviving and even thriving in a market retraction. The key to selling a lot more cars and getting you a lot more profit and making your customers a lot happier and more willing to refer and come back for service. We aren’t going to say that price isn’t important to customers because clearly it is. We’ve all felt that there is price sensitivity, but we would suggest that low price is far less valuable than solutions. When you think about it, there is a lot of talk about value and most people assume that means lowering prices. The interesting thing about value is that value is as valuable as it is; this means the less valuable something is, the lower the price is and the more valuable it is, the higher the price is. Solutions rank much higher in people’s minds in value than price alone does. Customers only turn to price when there are no other factors to consider and when there’s really nothing else to choose by. So if someone can solve your problem or some product or service can solve your problem, that has much greater value and you’re willing to pay more. First of all, a very practical solution is to become a trusted advisor, instead of simply being a product-pusher. When you place your ads with prices and payments, when you upload your cars to inventory listing sites, you’re a product-pusher. The Sears ad with the washer and dryer is product-pushing. We are encouraging you to provide solutions, help and advice, instead of simply being a product-pusher who’s just worried about merchandising the next vehicle and thinking about what price to put on the windshield or the web site. It’s rare to find a trusted advisor who is willing to solve your problems. People gladly pay top dollar to trusted advisors, but they haggle over nickels with merchants. Being a trusted advisor means being there for your customers, whether they are ready to buy or not. Be there with answers, solutions and help. One of the ways you can do that, a very practical way, is to create helpful information that addresses fears, concerns, and problems that people have when buying a car. We give our members multiple ways to become instant authors, experts, thought-leaders and celebrities. We show them simple and immediate methods of leveraging information, technology and the written word to differentiate themselves and stand out. With our systems and strategies anyone can harness the persuasive power of experts and authors even if they’ve never written a single word or done anything like it before. Don’t think that just because you’re in the car business you’re limited to being a car dealer. Better to be an expert who also runs a car dealership than a merchant who runs a car dealership. By now you are loaded for bear. The ideas, methods and strategies we’ve shared with you are so powerful and potent, perhaps beyond comprehension. We want to advise you: do not try any of these strategies unless you are committed to the results that can be generated when you do something like this. This stuff works. But it’s a double-edged sword. You need to be prepared to handle the traffic and be committed to providing value, not just selling the lowest price. It’s harder work, but it’s more fun and more rewarding. Preparation is the key. It’s best to be guided by someone who understands how to use these principles and by someone who has used them effectively in the past. Get connected with a group of like-minded dealers who will share ideas and compare notes. You’ll learn and grow faster when you learn and grow with others. Imagine being immune to changes in the market. Ahhh…relief. Now you’re armed, you’re informed and you’ve demonstrated your willingness to seek out real solutions. You no longer have to be at the mercy of the market. You no longer have to sacrifice profit just to survive. You no longer have to be a victim. In us, you have found the solution. I found your article very informative and well written. I particularly agree with your comments about competing for the 2 % active when attention should be on the 98% others who are not active. Everyone is at some stage of the buying process. Why doe car companies still put ads on TV. I also agree that dealers need to start selling solutions not cars. So how do you bring in potential customers who are not thinking of buying a new car. Three years back Mercedes Benz dealers sent me a notice that I could come by and test drive their 300 and 500 model SUV. Once registered and I was given an appointment time where I came to area that had cars and a course laid out. My turn came up and I drove the car through the course. I did not buy but was impressed with this technique. We work with used car dealerships and provide them with a specialized lubricants, engine , transmission,fuel, axle and transfer cases and radiator treatments that improved the performance providing increased fuel mileage, power and component life. Similar to the way Ford market their Eco Boost technology, we provide the dealers to offer a “Pro-Line Protected” vehicle.